Whether you are passing through with your bike, or have come to the area to enjoy awe-inspiring views, Bishop offers amazing cycling for the casual rider, the serious athlete, and everyone in between. We promise you will not be disappointed. As you ride through one of the world’s deepest valleys, you will be treated to stunning mountain scenery in just about every direction. Enjoy views of the Sierra Nevada to the West, the White Mountains to the East, and you may even catch glimpses of the Glass Mountains to the North. And with nearly 10,000 feet of elevation gain on either side of the Owens Valley, you can seek out “hills” of any size! Bishop Creek trailheads, Pine Creek trailhead and Westguard Pass are popular climbs that will challenge even the fittest cyclist. For another big hill climb read this blog post about riding Bishop to Rock Creek. Moreover, Bishop is still a small town with little to moderate traffic off the main highways, making any ride more relaxing and enjoyable. Below are some well-known and much-loved local routes. To head out on any of these routes, park at Bishop City Park or in the lot behind City Hall, off of Church Street. The maps start at the intersection of Main Street (Hwy 395) and Line Street (Hwy 162). This is a quick, unusually flat ride just south-east of town, 14 miles long with 258 feet of elevation gain. Cycle along the foothills of the White Mountains and enjoy views of the Sierra Nevada across the way—the further you get from town, the less traffic you encounter until you meet up again with Highway 395. Cottonwoods dot the fields of Sagebrush and you pass over the Owens River twice for a brief view of fishermen or waterfowl. Directions: East Line Street becomes Poleta Road. Just after 4 miles follow the curve right onto Eastside Road. At 7 miles, turn left onto Warm Springs Road, follow this until you reach Highway 395 and turn right back into town. Amazing views and surprising variety are the trademarks of this 31-mile partial loop ride with 1316 feet of elevation gain. The ride starts off with a lovely pastoral feel complete with cows and partially-collapsed ranch buildings, and then turns a bend into a secret watershed . Heading out of town, the roads slowly become less traveled and you feel as if you are cruising quiet country lanes. Mount Tom and the views up Bishop Creek add to the scenic rural beauty of your ride. The scenery soon changes again after crossing the Highway onto the volcanic tablelands and you will find yourself transported out of the seemingly dry landscape to the magic of the watershed around the Pleasant Valley Dam. The path gets a little bumpy here, slow down and look for waterfowl as you take in the scene. Head back to town and stop by one of our local eateries to complete a great tour of Round Valley and Bishop. Follow West Line Street out of town until you reach Red Hill Road at 3.3 miles, turn right. At the next intersection turn right onto Ed Powers Road. After about a mile, turn left onto Sawmill Road and continue for almost two miles. You will pass Millpond on your left, and then look for S Round Valley Road and turn left. If you reach the Highway you’ve gone too far. Take Round Valley Road for about 5 miles and you will reach Pine Creek Road. A school is at this intersection. You will continue straight on what is now N. Round Valley Road for another mile. Turn right onto Birchim Lane and continue for a little more than a mile. Turn left onto Lower Rock Creek Road and look for Gorge Road on your right. Turn here and cross Highway 395. At the junction turn right onto Owens River Road. Continue downhill along Owens River Road until you come to the hydro-electric facility. The road is closed to vehicular traffic at this point and you go through a pedestrian access point in the fence and continue along the Pleasant Valley Dam Road next to the water, then curving right down toward Highway 395. Cross the Highway and you are now on Sawmill Road. Now your route should look familiar: you’ve been here earlier. Continue to Ed Powers Road and turn right. Turn left onto Red Hill Road and then left again onto West Line Street to head back into town. Are these options a little too tame for your taste? 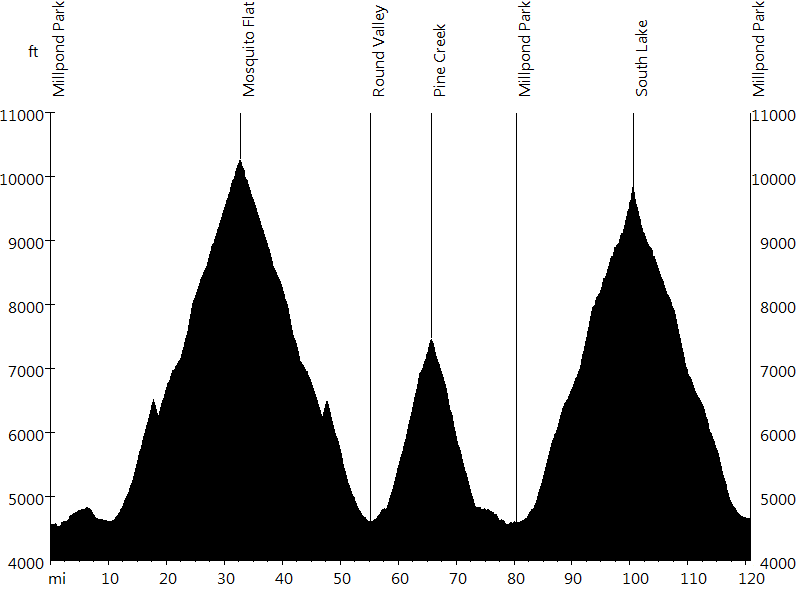 Challenge yourself and tackle the White Mountain Climb, called the 9th toughest bike climb in the United States. This information on this ride is from the Tour of California website. 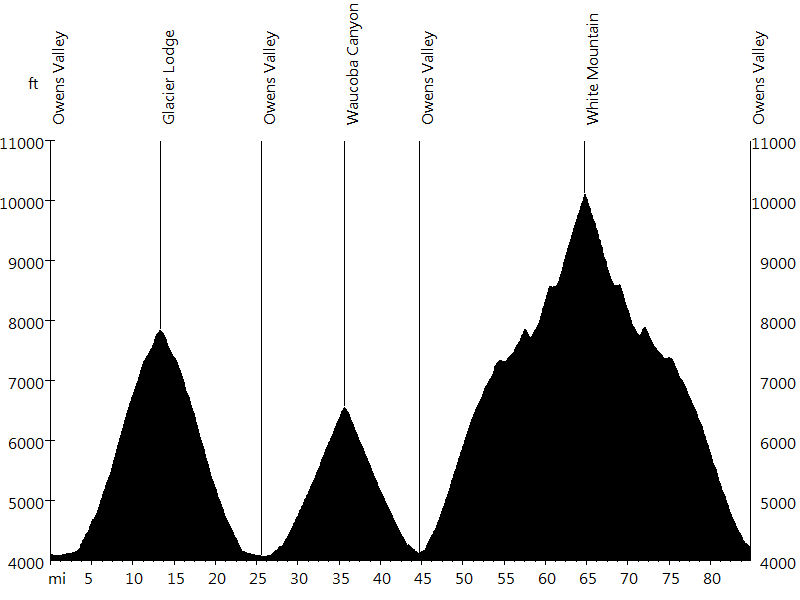 The Everest Challenge, was the California/Nevada State Climbing Championship for years – the hardest two-day U.S.C.F. (United States Cycling Federation) race and ride. You can read more about it and see the interactive map on their website. It is no longer an organized ride. That doesn’t mean you can’t go for it on your own or with some friends!! Just know that is is EXTREMELY challenging, and you would most likely want some support. Whether you are cycling a century, or taking a shorter option, road biking on the main highways is also popular. Caltrans bicycle info for Highway 168, Highway 120, Highway 6, Highway 395-Inyo County, Highway 395-Mono County, are great guides for road conditions, services, and resources along the way. A few words of caution: awareness on the road is a must. Some less-traveled roads may lull one into thinking there IS no traffic, but always follow the rules of the road and move over to the right and ride in a single file line when a car is passing. Ride friendly and enjoy yourselves! Arrowhead Cyclery in Bishop offers bike gear, repair and great local knowledge! Visit the shop when you are in town and say “Hi!” The Eastside Velo Club features some local rides, and offers group rides and events in the Eastern Sierra. Check out the article “Challenging the Giants of the Eastern Sierra Road” or “4 Wonderful Winter Road Bike Rides Around Bishop“.